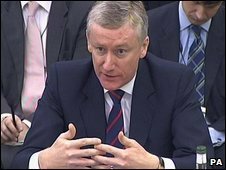 The government has asked the former chief executive of Royal Bank of Scotland, Sir Fred Goodwin, to forgo some of his pension. Chancellor Alistair Darling told the BBC of the government's approach after it emerged that Sir Fred is drawing a pension of £650,000 a year. Although he is only 50, he is entitled to the payment for life, with a pension pot worth £16m. "You cannot justify these excesses," Mr Darling told the BBC's Today programme. "We've got the lawyers looking at this, but I do think that on a voluntary basis, actually, Sir Fred could resolve this problem and he could do it quite quickly." Sir Fred stepped down in October last year as part of the government's rescue of the faltering bank. The controversy over his pension intensified as RBS announced that its 2008 loss totalled £24.1bn ($34.2bn) - the biggest annual loss in UK corporate history. Sir Fred's strategy and decision to buy ABN Amro is widely seen as making the bank more vulnerable to the credit crunch and having to be bailed out. 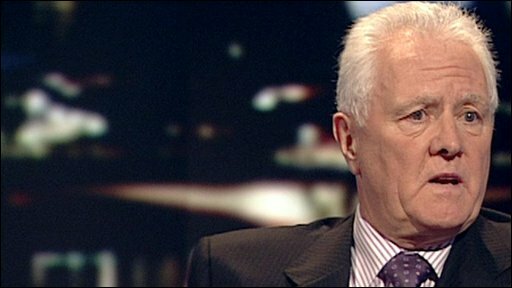 Mr Darling told the BBC: "At my request, my ministerial colleague, Lord Myners, spoke to Sir Fred [on Wednesday] and put it to him quite simply: look, in the circumstances in which this bank is now in, do you not think it right that you should forgo this?" The chancellor said the government had not yet received a reply to the request. "Obviously we will look at what we can do in relation to legal remedies, but I do think that, it's not just this case, but you cannot justify these excesses - especially when you've got such a failure of this magnitude. " Prime Minister Gordon Brown echoed Mr Darling's comments, saying: "Failure should not be rewarded. Practices are coming to light that have got to be dealt with. "Of course this is in the end a legal action matter and we'll have to wait for the outcome of that, if that is to take place. "Nobody can support very extensive pension arrangements at a time when the bank is both losing jobs of its employees and at the same time reporting major losses." Treasury Minister Stephen Timms had said earlier that UK Financial Investments, which manages the government's shareholding, had been working with the new RBS chairman and board with a view to "clawing back" some of the pension. Shadow chancellor George Osborne said Sir Fred "should in all decency renounce his pension" but questioned the government's assertions that it had only recently learned of the deal. "Whichever way one looks at it, this obscene pension is unacceptable and the government is on the hook. Either they did know and failed to act, or didn't know and failed to ask the right questions," he said. The Liberal Democrats' economy spokesman, Vince Cable, described the pension arrangement as "an absolute disgrace", adding: "There may be an issue about whether the government should just stop it, and leave him to sue if he wants it." For its part, the City watchdog, the Financial Services Authority (FSA), published a new draft code on remuneration policies on Wednesday, saying that firms should make sure their policies did not expose them to excessive risk. The Treasury select committee is conducting its own inquiry into the banking crisis. Its chairman, John McFall, said: "I think it is a scandal. [Sir Fred] is leaving not with a good pension, but one that is eye-watering." When giving evidence to the Treasury Committee on 10 February, Sir Fred said: "My pension is the same as everyone else in the bank who is in a defined benefit pension scheme. It is determined in the same way as anyone else." But few other employees of RBS are understood to be able to draw their pension at the age of 50, although BBC business editor Robert Peston says that his entitlement to a pension at 50 if he was asked to leave the bank, was put in place some years ago and was applied to other directors. RBS also issued a statement, saying: "The company is taking further legal advice in respect of certain aspects of Sir Fred Goodwin's contractual arrangements and continues to discuss the position with UKFI."